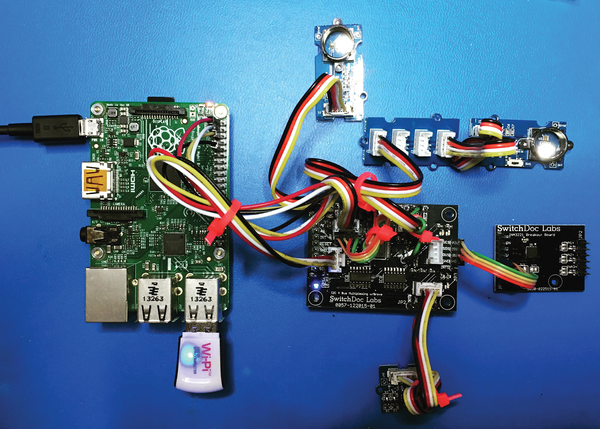 The use of Grove connectors really opens up the possibilities for rapidly prototyping different systems and different configurations. I am using this system in the solar-powered SunRover robot to great effectiveness (Figure 11). It lets me organize components and allows for flexibility in configuration. I will be talking about a number of specialized Grove modules in future columns. Figure 11: The Grove system in SunRover. The debate at SwitchDoc Labs has been: Do we do a project with the ZX distance and gesture sensor from SparkFun , or do we finish the solar project series first? After some back and forth: Solar power fans, start your engines. Again. The sunny part of the year is coming, so I am now going to build two ESP8266 solar-powered units. I will be setting up and executing a test on how much additional solar power you can get by adding sun tracking to your solar-powered Pi or Arduino projects. I am running two computers side by side on solar panels, with one tracking the sun and the other facing due south. It should be interesting to find out the exact numbers. A Raspberry Pi will collect all the data by reading the JSON from the individual solar-powered ESP8266 units. Back to the gesture sensor in the near future! Figure 10: Grove four-channel I2C mux with five I2C devices hooked up. 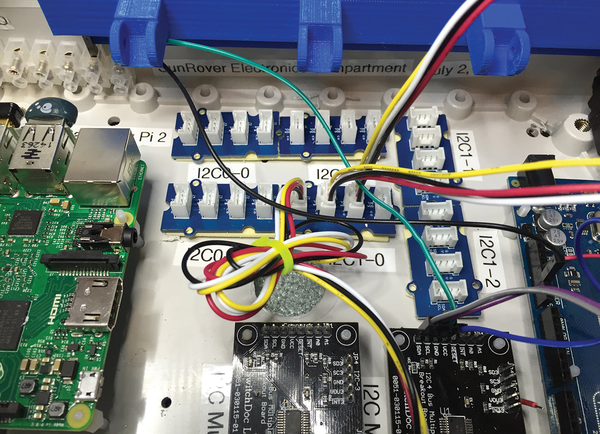 Q: I have an AM2315 I2C encased temperature and humidity sensor (Figure 12) for outside use, and I can't see it on i2cdetect on the Raspberry Pi or the I2C scanner on the Arduino. Is it bad? A: Naughty sensor. It is very unlikely the sensor is dead. Possible? Yes. Likely? No. 1. Check your wiring. Note that the colors aren't a reliable guide to what wire goes where. Make sure you read the label on the wires. I'm sure you have done this, but check it again. The colors vary from batch to batch. 2. 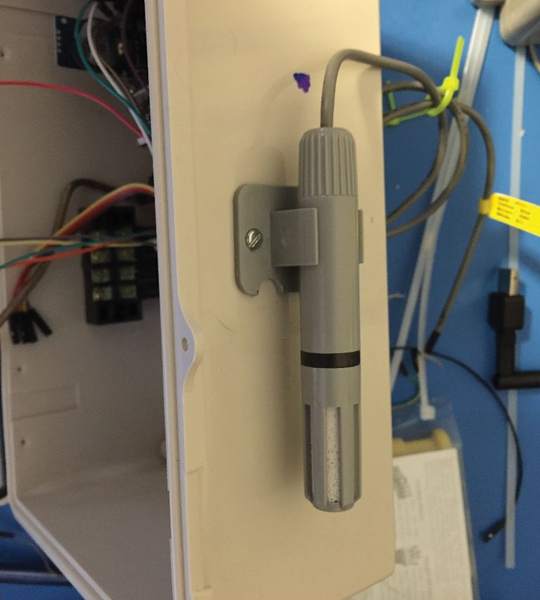 The AM2315 outdoor temperature sensor is at address 0x5C. The manufacturer of the device puts the sensor into sleep mode, except when it is going to be used, to avoid self-heating. This means you have to go through a sequence to make sure the device is awake and responding, which is why it doesn't respond to an Arduino I2C scan or a Raspberry Pi i2cdetect. The best thing to do to determine if it is actually there is to run the test software for the Raspberry Pi  and the Arduino  and see if you are getting data. This is how I detect whether it is present. I get this question quite often, and I have never had a dead sensor yet; however, there is always a first time! Figure 12: An AM2315 on the side of WeatherPi.